It’s been a while since I’ve written here, but I’ve spent the past month preparing for my last residency and then attending the residency, and now I can say with pride that I have received my MFA in Creative Writing (not without literal blood, sweat and tears, mind). After a chaotic week of traveling, writing, revising, and holding/attending seminars and readings, this first post — written in my lingering post-MFA stupor — will return to an old series on visual art and look at the work of Edward Hopper. In the past, I’ve written about other favorites of mine (Munch, Friedrich, Bacon, and Turner) and showcased particular paintings that inspire and inform my own work in fiction — not (just) their subject matter, but the ways in which they treat their subjects. Visual art (in attempting it myself and in viewing actual artists’ work) helps me to see and — more importantly — feel the world in new ways. What one learns in studying paintings is that two-dimensional color and form are not stationary things — they move and breathe. They pulse, even in stillness. Edward Hopper (1882-1967) is one of the best known artists of the Ashcan School, a group of painters that sought, above all, not to romanticize their subjects, but to paint life as they knew it (gritty, rough, chaotic) in New York City in the early 19th century. As Robert Henri said, “Forget about art!…and paint pictures of what interests you in life.” The goal wasn’t to strive for perfection or beauty, but to get at the heart of the bleak, gritty spirit of city life they felt all around them. Hopper’s work diverges slightly from the others in that it focuses on quiet, ordinary, usually solitary moments (as opposed to other Ashcan painters’ scenes of rushing street traffic, portraits and boxing matches). 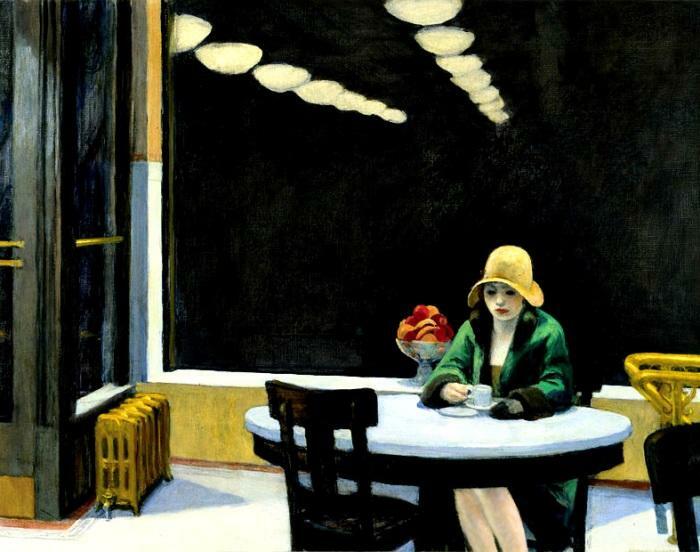 His most famous piece, Automat, is of a woman at a cafe table with a cup of coffee. 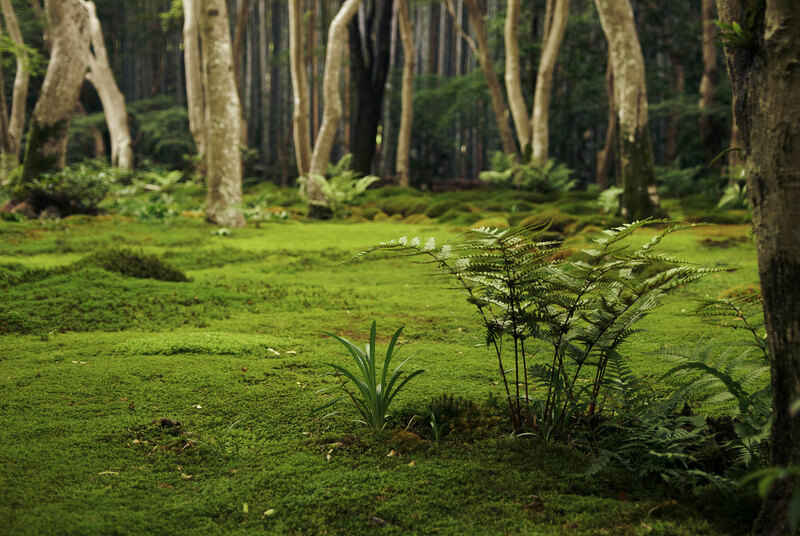 It’s something that could (and, with a change of clothing, still can) be seen anywhere. But the way in which Hopper paints his subjects — heavily, darkly and in some form of isolation — expresses a somber, resigned solitude. Even when there are two or more human subjects, there’s a palpable loneliness. His paintings are so saturated and smoothly stroked that they look almost flat, but upon closer inspection — especially of the human subject’s skin — one finds a subtle, visual rippling (as in Morning in a City). It’s that sense of isolation and the juxtaposition of flat heaviness and richly undulating sensuality that gives the paintings a strange, voyeuristic intimacy. It’s as if the viewer is peering through a window at night, watching people in their houses and apartments or in public places, catching them in their most private, most vulnerable, and most true moments. 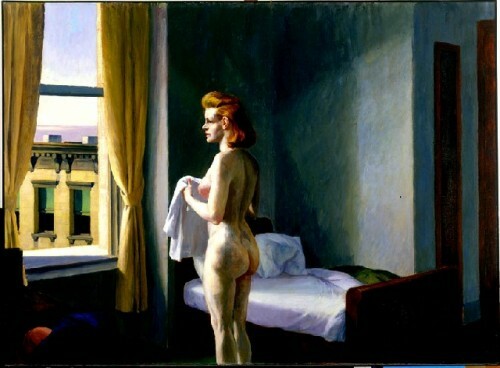 That’s what I love about Hopper’s work: the heavy vulnerability, the shared loneliness. Those characteristics are defining quirks of humanity, I think, and to see them displayed so honestly, without the polite softening of the averted gaze, is to be pulled outward, to find core aspects of oneself in others and yet to recognize that, in spite of that sympathy and sensitivity, there are barriers that can never be crossed; we are essentially alone in our experience of life, but together in it. At least, that’s the truth I find in his work. Take a good, long look at each of the following Hopper images and, in the comment box below, tell me what you see. For more information about Edward Hopper and his work, check out this great site by the National Gallery of Art. Is it possible that no one painted shadows and loneliness better than Hopper? See Coast Guard Station or some of the other lighthouse paintings, or the rooftop paintings for great shadows. Room in New York is a great example of people together, yet alone. There is no interaction between subjects in Hopper’s work. They behave as if they don’t know one another. See Cape Cod Evening, Second Story Sunlight, or Sea Watchers, and of course Nighthawks. Summer Evening, ehhh, it’s a stretch, the girl is indifferent… Your thoughts? Nice Post, great artist, well done! Hi Joseph! Thanks for dropping by and suggesting all of those great Hopper pieces. You’re right that Summer Evening is less obviously lonely because there’s more of a sense of interaction between the boy and girl than in, say, Room in New York. But I’d still say that loneliness is very present there. There’s so much darkness around the bungalow, which adds a lot of oppressive, isolating weight to the painting and makes the couple seem cut off from the rest of the world, disconnected, caught in a void. The girl’s eyes are downcast and shrouded in shadow, mimicking the oppressive darkness around them and all that it suggests. As you said, she looks indifferent — she’s not interacting with the boy, even though it’s clear that he’s trying to talk to her. So there’s still that burden of separateness between them, that heavy sense of a near-but-missed connection. But, as in other Hopper paintings, the disconnectedness is more resigned than desperate, which (to me) makes it more tragic. In many ways, I think Summer Evening shows the beginning, or seed, of isolation in romance (romantic isolation?) and Room in New York expresses the later development of it — emotional/intellectual isolation in full bloom — which is interesting because he painted the latter 15 years before the former. It’s almost as if he started at the end and worked his way back to the beginning. I love Hopper’s distinct brand of loneliness and I’m glad you admire his work as well. Thanks again for your comments! I really liked his painting chop suey. Heid, I agree with your observation that in Hopper’s works, his images seem distant or lonely. I felt the same thing without even studying them very long. I, too, love his work. Of course, I love people watching so that may have something to do with my fascination with his art. I also love that the images seem so “art deco” which is probably because of the time period in which he worked. Everyone in the paintings you posted seemed so “lost in thought,” almost as if they were alone, whether they were or not. Just as you observed, they were “together” yet seemed all alone. I feel this type of painting is thought provoking because you get to sort of tell your own story about what you think is happening with the character(s). The artist isn’t trying to tell you the story as much as he’s leaving it to your imagination to come up with your own. I also wanted to comment on the “automat.” It’s sad that a part of our history is gone (I wanted to call it Americana, but the automat originated in Germany, I believe). It seems to me that not that long ago, we still had mini-automats in hospitals or places like that where it wasn’t as easy to go out and pick up fast food at some franchise. I love the idea of getting a meal by putting your coins in a slot and choosing a sandwich or whatever through a glass door. Also, did you notice the body language in “Room in New York”? The woman seems to be saying, through the way she’s sitting, that she doesn’t even want to be in the same room as the man. If she did, it seems as though she would have put her book on the table beside her while reading or at least position her body more toward the man. She seems awkwardly angled away from him and quite uncomfortable. Maybe that’s how she feels about him, distant and awkward and yet he seems oblivious to it. And doesn’t it seem as if characters in “Summer Evening” just received some bad news? Maybe they just learned that the girl is pregnant and they’re contemplating their options. Or perhaps they just found out someone they were close to died. It does look like the girl is lost in thought or very contemplative while the guy seems to be trying to ease her mind. See what I mean about the stories you can make up just from the simple portraits Hopper created? It’s really a lot of fun and quite participatory. I believe that was Hopper’s intention. It’s interesting to note that Hopper wasn’t always intentionally portraying people as lonely (or separate though together). He said of his “Nighthawks” painting (incidentally one of my favorites), “I didn’t see it as particularly lonely… Unconsciously, probably, I was painting the loneliness of a large city.” I adore its early morning cafe setting. I would love to be “a fly on the wall” and try to figure out these people’s stories. Hey, Mom! I’m so glad you read this and left such great comments! You made a great point about the “telling your own story” aspect of the paintings. I love that, too. The open-endedness is what makes it so compelling; it works like a mirror and the subject’s story becomes your story, in a way. It’s interesting what you said about the automats — how you’re ordering and receiving food not from a person, but a machine that’s stocked with food behind glass — because it reveals a lot about what Hopper is saying about the woman in the painting: she’s cut-off, unreachable, especially from the viewer; she’s behind a kind of glass as well. 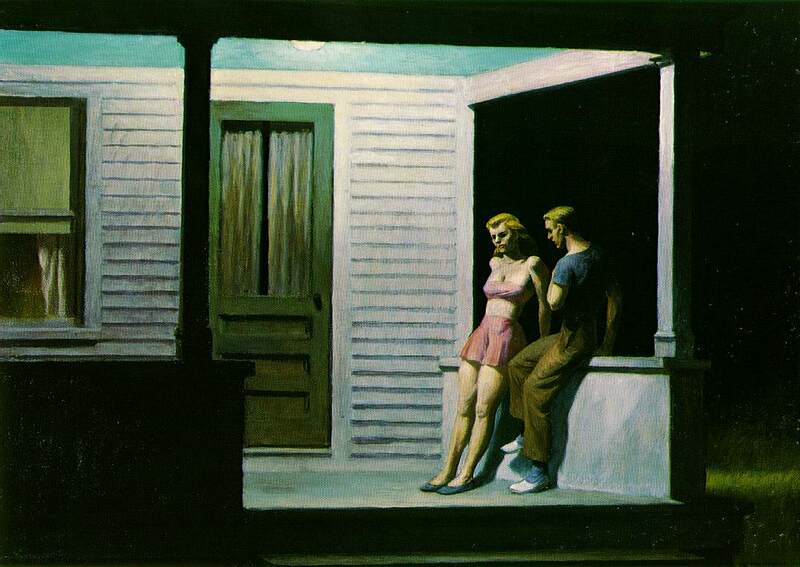 And that’s a core statement in Hopper’s art: that people are isolated from one another, even in close proximity. You can look, but you can’t interact. I agree with you about the body language in “Evening in New York”; there’s definitely an invisible, impassable wall between the couple that they can’t bridge because they can’t even look at each other. Also, I love that you pointed out the voyeuristic/exhibitionist quality of “Morning in a City.” I hadn’t thought about that before — that there are layers of voyeurism and exhibitionism in it. That’s a great point to make. And thanks for sharing the Hopper quote. It is interesting that he hadn’t initially intended for “Nighthawks” to be lonely. Art definitely reveals things about the artist, whether the artist is immediately conscious of those things or not.